Chandos are the latest big label to get onto the �historical� bandwagon realising, presumably, that many music lovers do find something special in music making of previous eras. Not all reissues are of the same importance. I can name a few that could (for me) have happily stayed in the archives gathering dust. However, the present release is an important one, even if it is not all that �historical� in terms of actual years. In fact there may well be many collectors who easily remember its first incarnation, which is just as well, as we get no recording details at all. Other companies more experienced in the field (Dutton, Testament, Naxos) are at pains to discuss the actual recordings as much as the music, which is entirely right; we are paying good money for old recordings because of the special nature of the artists and performances, so it is vital that we know something of the circumstances surrounding the recording. The Chandos booklet is exemplary in its discussion of the music, where every quartet is considered in some detail, and it would have been a simple matter to include such details (there is a brief paragraph on the Borodins, but nothing specifically relating to these performances). So, we are left to guess as to its provenance, which would appear to be the Borodin�s first cycle, recorded by Melodiya through the 1960s up to 1970, the date of the (then) latest quartet, No.13. This would seem to be borne out by the fact that their 1980s EMI recording of all 15 quartets is usually referred to as the second cycle, when the personnel had also changed. The recording quality, which is slightly up-front, with a trace of tape rumble, might also suggest Melodiya origins, though it has been cleaned up remarkably well by Chandos and is perfectly acceptable. So we have quartets 1-13 played by a group who had a close affinity with the composer, personally discussing many details of interpretation with him. This happens to be true of two other recorded cycles by the equally famous Beethoven Quartet (responsible for the majority of premieres) and the Fitzwilliams, who worked with the composer in his last years. The Beethoven cycle is on five well-filled discs, but in more primitive sound (including some mono) and the Fitzwilliams have excellent sound on Decca but are spread onto six discs. The present release, being shorn of the last two quartets, has been economically accommodated on four budget priced discs, albeit with some shuffling of the order. So it makes sense commercially, and artistically must be counted second to none. This is apparent from the very outset. 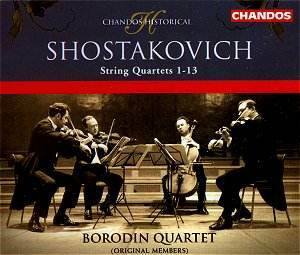 It is generally accepted among scholars that, unlike Bartók, Shostakovich did not seek to strain the string quartet medium beyond its existing limits. He preferred to work within the already defined parameters, refining and sublimating it for his own artistic ends. The fact that the First Quartet is not early in his output, having been written just after the Fifth Symphony, means that we hear a mature voice from the start. The almost naïve simplicity and classical proportions of the piece could be seen, at least in the Borodin�s hands, to mask something deeper, more complex. They play with a serene restraint and slight coolness that give a feeling of false security. The witty, high-spirited finale hints at the ambivalence inherent in this composer�s work, a feeling borne out as the cycle progresses. The feeling that we are eavesdropping on a sort of personal aural diary becomes more apparent with the Third Quartet, which Norman Lebrecht sees as �opening a triptych of private torture chamber works�. Indeed, the Fourth and Fifth Quartets could not be performed until after Stalin�s death, such was the climate of fear and anxiety at the time. The Third has telling subtitles, such as �Calm unawareness of the future cataclysm� and �The forces of war unleashed� and the Borodin�s immaculate phrasing, incisiveness and sheer personality ensure that none of this subtext is lost. They outshine many modern rivals in terms of tonal blend and intonation, but the way they dig into musical lines to reveal the hidden depth is even more memorable. The more the cycle continues, the grimmer it becomes, with �gaiety quickly turning to anger, anger into comedy, comedy into irony and irony into a dull numbness of the soul�, to quote Philip Taylor�s excellent note. The Borodins reveal this and more, with the most famous piece, the Eighth, receiving the most memorable performance. Here, the by now all-pervasive use of the personal motto DSCH as well as the littering of self-quotations reveal the tormented artist�s innermost secrets. The Borodins themselves must have known the anxiety of those times, and never have the famous triple-quaver �knocks of fate� been delivered with such trenchant power (Disc 3, track 7). The feeling of doom and desolation is so well captured in these performances that it is easy to overlook other subtleties. The little sarcastic waltzes (so Mahler-like) that litter the works, are delivered with such bitter irony that one is left in no doubt of the undercurrent � and it is worth remembering that these performances are all pre-Testimony. The fooling around with serial methods in the Twelfth Quartet is shown by this performance to be just that, and in this playing one feels that the finale does offer some genuine hope, a contrast to the false hope of many of his symphonic finales. It can only be concluded that this set is a valuable document and a welcome re-addition to the Shostakovich discography. There is certainly no shortage of eminent cycles available. As well as the two mentioned above, there is an excellent digital set from the Emersons, an ongoing budget Naxos cycle from the Eders, and what looks to be a growing cycle worth watching from the St.Petersburg Quartet on Hyperion. But this Chandos set is special, with the original Borodins displaying the sort of depth and insight that only comes along rarely on disc, and as such should be snapped up without delay.